I suspect that the strong dollar and overall tepid overseas growth is adversely impacting orders for U.S. durable goods. New orders for durable goods declined by $3.2B in February of 1.4% to $231.2B. census.gov/manufacturing.pdf Excluding transportation, new orders decreased by .4%. Swiss RE published a study that estimates savers have lost $470B in interest rate income (2008-2013) due to the FED's abnormal monetary policies. EU and U.S. insurers have lost about $400B in yield income, which constitutes in effect an annual "tax" of "roughly 0.8% of total financial assets on average, lowering long-term investor's capacity to channel funds to the real economy". Swiss Re The full report can be downloaded at the preceding link. A report from Deutsche Bank, reprinted in The Big Picture blog, contains data highlighting wage inflation when taking into account hourly earnings plus other forms of compensation. The government's third estimate of 4th quarter real GDP remained unchanged at 2.2%. News Release: Gross Domestic Product Real personal consumption expenditures rose 4.4% in the 4th quarter, up from 3.2% in the third. Hercules Technology Growth Capital (HTGC) announced its intention to redeem $20M of its 7% unsecured senior note maturing in 2019, or about 24% of the outstanding principal amount. HTGC intends to make additional partial redemptions through 2015. While I have not ever tried to sell the "when issue money" shares, I suspect that I could not do so unless the shares were not redeemed for whatever reason and journaled back. Many years ago, before the shares subject to redemption were journaled, I sold an entire position unaware of the partial call and then had to buy back the shares subject to redemption. I have no choice but to allow this happen. There is no reason for me to sell any shares, since I will be receiving par value, which will result in a small profit, plus accrued interest for any shares redeemed without having to incur a brokerage commission. This purchase brings me back up to 478+ CSG shares. 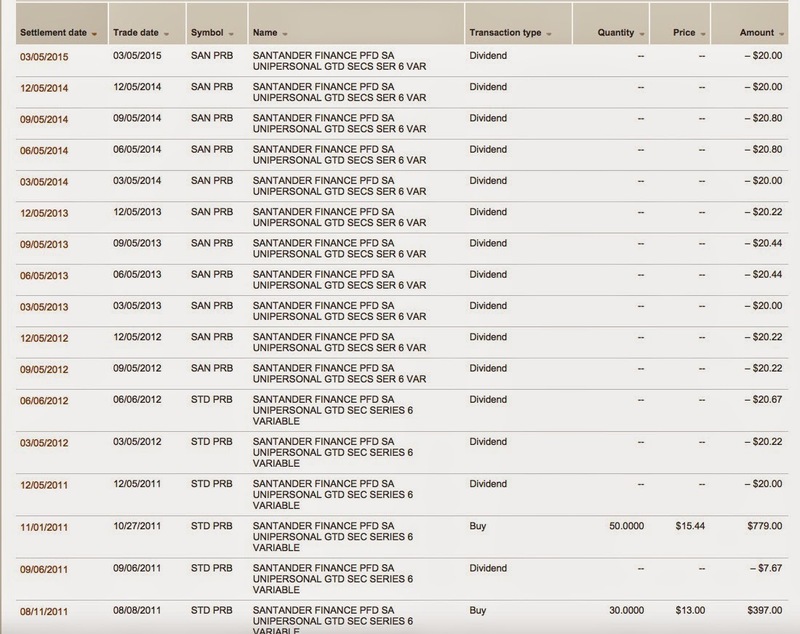 CSG went ex dividend for its monthly distribution on 5/26/15, the day after my purchase. Since this trade was an example of a trading system that I use, I wanted to explain that system in more detail. For a "trading core position", I am unlikely to sell all shares, unless there is a fundamental adverse development that is likely to impact the company long term. Instead, I will trade the position by selling my highest cost shares profitably into rallies and then wait for an opportunity to buy back the shares. I will frequently use a two year chart when making the decision to pare or to buy back shares. CSG Interactive Stock Chart That chart revealed that a price over $8.5 was a decent exit point for a pare, and I sold 100 of my highest cost shares at $8.76 during the early February 2015 price spurt. I would then set a price target for a possible repurchase. In retrospect, I was not satisfied with my initial CSG purchase price, one reason for placing it in the trading core category, and started to average down soon after my initial 150 lot purchase at $8.4 (11/19/13 Post). I forgot that I owned 150 shares in that highest cost lot and instead sold 100 CSG at $8.76 (2/28/15 Post). That was an Old Geezer type breakdown in this trading system. I placed a limit order to buy back that 100 share lot at $7.74, which was filled on 3/26/14. In that account, I now own 371+ shares, with the balance owned in a Roth IRA account. At Fidelity, I can enter an All or None GTC order for a 100 share lot. Other purchases in this account are discussed in Item # 5 Added 100 CSG at $7.85-Average Down (8/29/14 Post) and in Item # 3 Bought 100 CSG at $7.73 (April 2014). My average cost per share in the taxable account is now $7.89. I will be able to reduce it some by unloading the remaining 50 shares bought at $8.4, but I am in no hurry to do so. When I decide to unload that 50 share lot at a profit, I will probably include my highest cost shares purchased with dividends, provided their disposition will lower my average cost per share and can be sold at a profit which would increase the value of the original dividend. For taxable accounts, I am also reducing my tax obligation by selling the highest cost shares. The primary goals for a trading core position are to use the stock's volatility to lower my average cost over a long period of time while realizing some profits along the way including the harvesting of dividends used to purchase shares. 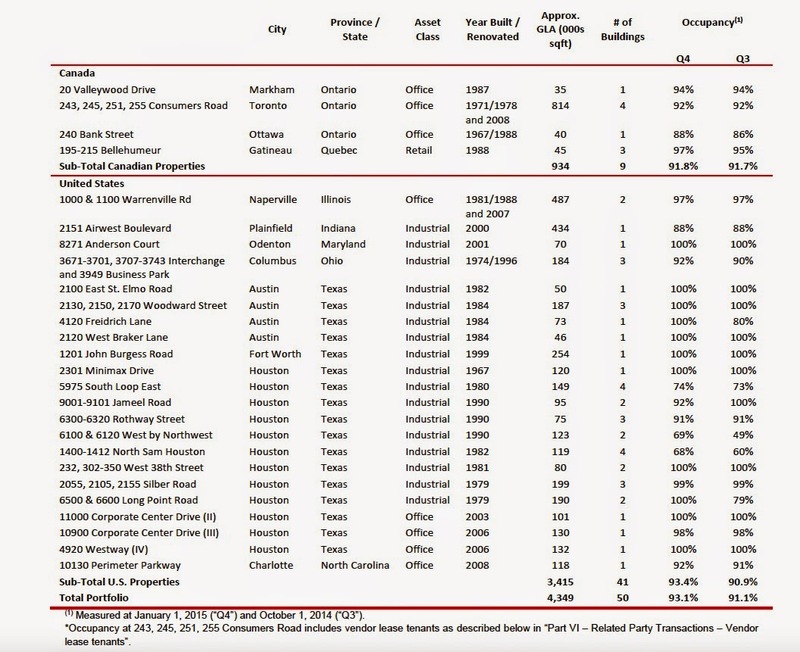 Company Description: As of 12/31/14 Chambers Street Properties (CSG) is an internally managed REIT that owns or has majority interests in 128 industrial and office properties located in 19 states and western Europe. Property Portfolio: Pictures of the properties can be found at Chambers' website. About 76.2% of the portfolio is subject to triple net leases, where the lessee is responsible for property taxes, insurance and maintenance costs that would normally be paid by the lessor. Total rentable square feet for the 128 properties was 37,740,832 as of 12/31/14. CSG has been moving toward a higher concentration of industrial properties and has eliminated its retail exposure. Occupancy was at 98.3% as of 12/31/14. About 10.2% of the total portfolio is located in the U.K. and western Europe. Those properties are 100% triple net leased (12 industrial; 1 Office). The one office property is located in London. Amazon has a 9.9% weighting. CSG's corporate issuer rating is Baa3 by Moody's and BBB- by S & P. Both of those ratings are investment grade, but only one notch above junk. At that monthly penny rate, the dividend yield would be about 6.59% at a total cost of $7.74 per share. During 2014, CSG realized a gain of $21.2M related to the sale of properties. The $.11952 per share classified as ROC will reduce the cost basis by an equivalent amount. If the shares are held in a taxable account for over a year, and are sold for a long term capital gain, then that is the only meaningful way to achieve a 15% maximum tax rate on distributions made by REITs. Since I am retired with no pension other than social security and have no earned income anymore, I am consequently in a lower tax bracket than when I had earned income. I am no longer concerned about making a distinction between qualified and non-qualified dividends when selecting securities for purchase in taxable accounts for that reason and others. Instead, I am more focused on income generation and capital preservation. Even if I exceed a 15% marginal rate now, the taxes associated with REIT distributions are reduced by ROC and capital gains classifications, and neither of those classifications are relevant in an IRA. Chart: The company was formed in 2004 following a private placement of shares. CSG started to trade as a public company in May 2013. The shares then spiked up to $9.5, but that rally was short circuited in late October 2013, with the shares falling again. Subsequent to that last spike down which formed multiple bottoms in the $7.5 to $7.65 range, the shares have mostly traded in a whipsaw $7.5 to $8.5 channel. Last Earnings Report: For the 2014 4th quarter, CSG reported CORE FFO of $.18 per share, up 6.3% from the 2013 4th quarter. The core FFO number for 2014 increased 3.4% to $.69 per share. FFO for the quarter was $.14, negatively impacted by a $5.2M severance expense related to the CEO's planned retirement. The AFFO calculation takes the Core FFO number, which excludes the CEO's severance package costs, acquisition related costs and costs related to the early extinguishment of debt, and then makes a number of positive and negative adjustments to that number. The most important deductions involve $4.306M for "recurring capital expenditures" and $.785M for the pro-rata share of "recurring capital expenditures" made in the joint ventures. There is also a deduction for straight line rent, a difficult concept to understand for those without any training in accounting and whose careers did not relate to real estate. I am willing to make the adjustment to FFO for the CEO's severance package costs. That item is non-recurring. 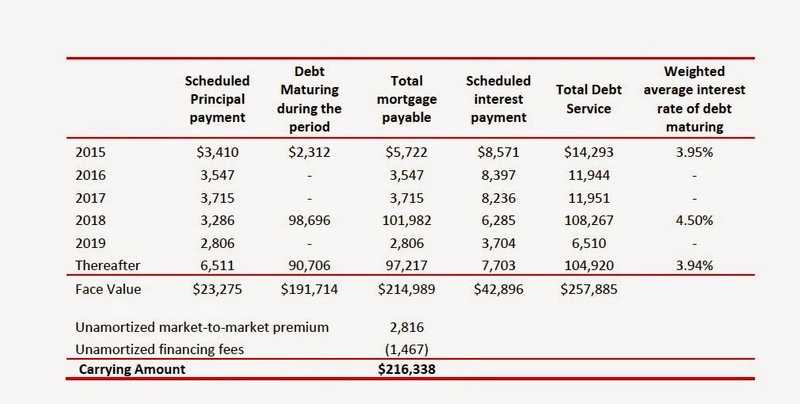 To arrive at an appropriate cash flow number, I would not exclude acquisition related and debt refinancing charges, since those costs are recurring IMO. I certainly would exclude recurring capital expenditures from FFO. I would exclude straight line rent based on my understanding of that accounting concept. A back of the envelope computation leaves me with $38.433M in Core Funds from Operations, rather than the $41.528M shown by the company and consequently a lower in AFFO number of $34.307. 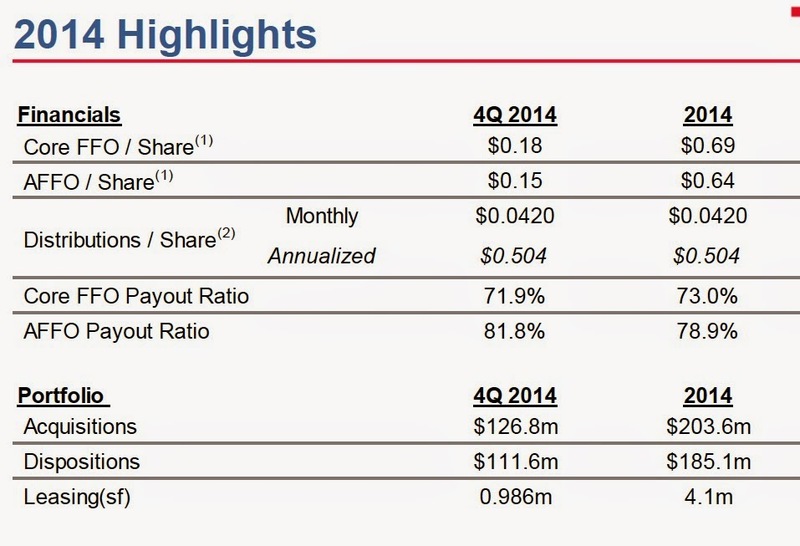 That gives me about a $.1448 per share AFFO number for the 4th quarter rather than the $.15 shown by the company. This difference is simply based on my opinion about what I personally consider to be the appropriate free cash flow number, and is not a criticism of CSG's accounting. Through the preceding adjustments, I reduced the 2014 AFFO number from $151.343M to $148.594M by deducting acquisition related and debt extinguishment expenses for the year. That reduces 2014 AFFO per share to $.6273 from $.64. Using the $.6273 number, the TTM P/AFFO is about 12.339 based on a total cost of $7.74. For those inclined to use the 2014 $.69 core FFO per share number, and I am not going to use that one for the reasons explained above, the TTM P/FFO would be about 11.22. Either number suggests a reasonable valuation at the $7.74 price. The funds available for distribution number in relation to the dividend gives the investor a better number to judge the sustainability of the current dividend and the REIT's ability to increase it. Guidance for 2015: The company estimated 2015 core FFO of $.68 to $.71, close to flat compared to 2014. That guidance does not include the effect of unannounced property additions and dispositions. This lackluster guidance was included in the earnings release that was published before the market opened on 2/25/15. The shares closed at C$8.3 on 2/25. Rationale: I am trying to keep this section simple and to focus just on the core reasons supporting a purchase. For CSG, the valuation is reasonable and the current dividend yield is good in a world without any risk free yield. The dividend yield, coupled with immaterial dividend growth, would not look so hot when and if a FDIC insured savings account yields 4%, at least for an investor with my risk profile, overall financial condition and age. I hope to increase my total returns over time by opportunistic trades. I may buy another 100 shares on a price dip close to $7.25. I will sell the highest cost 50 share along with some higher cost shares purchased with dividends at or above $8.75. Most likely, I would sell the reinvested dividend shares bought at over $8 which can be done profitably at that target price. Risks/Issues: The company discusses risks incident to its operations starting at page 5 of its recently filed 2014 Annual Report: 2014 10-K I believe that an investor needs to review that kind of material, which is too lengthy to summarize here anyway. Chambers will need to grow AFFO at a faster pace that will increase its ability to grow the dividend. With lackluster growth anticipated for 2015, I would not anticipate a material dividend increase and would expect a range bound stock price that will be more influenced by interest rate movements than the company's reports, assuming they are in line with that lackluster forward guidance mentioned above. 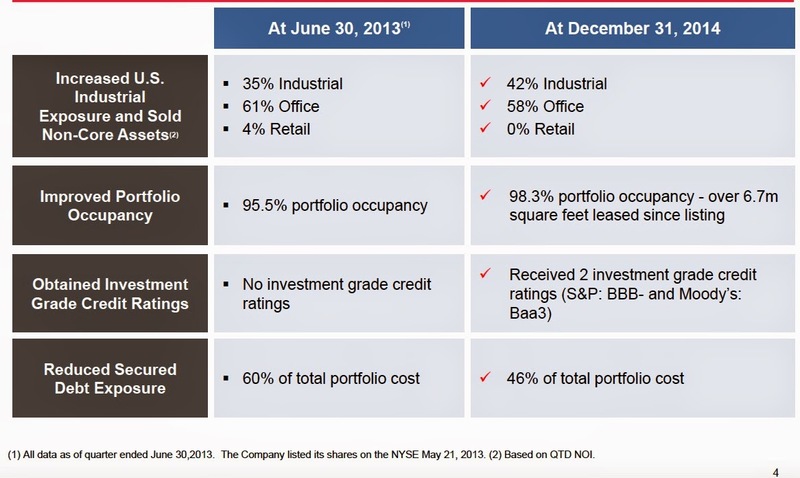 Lexington REIT has the same fundamental problem which explains in my opinion its low P/AFFO ratio. Added To LXP At $9.85-Roth IRA - South Gent | Seeking Alpha I also have that stock in my "trading core position". The purchase at $9.85 replaced 50 of the 54+ shares sold at $11.44 Vanguard Roth IRA. The European properties create some currency risks. There is some concentration risk as well (e.g. Amazon). 2. Sold 100 BTZ at $13.65 Roth IRA (see Disclaimer): I still own 420+ shares in another Roth IRA, but I quit reinvesting the dividend after the January 2015 payment. 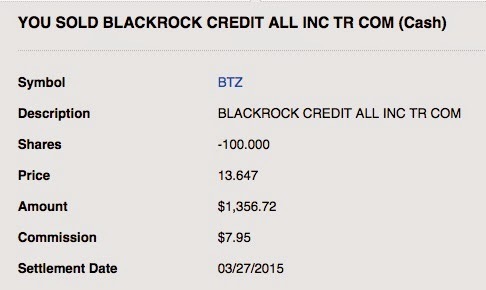 Security Description: The BlackRock Credit Allocation Income Trust (BTZ) is a closed end leveraged bond fund that is weighted in investment grade bonds, though the fund has a significant weighting in junk rated bonds. 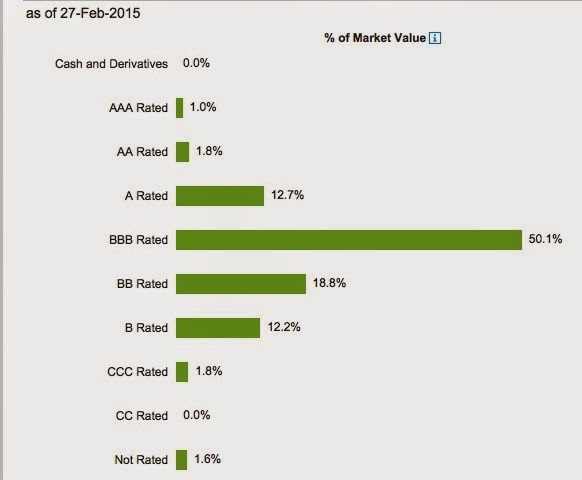 According to the sponsor, the effective duration was 6.08 years as of 2/27/15, with a leverage ratio of 29.81%. A duration of 6.08 years provides the investor with a rule of thumb about the potential impact of interest rate changes on the bond fund's portfolio. A 1% rise in rates would likely cause a 6.08% decline in value, while a 2% rise in rates would generate close to a 12% decline in value. Conversely, a 1% decline in rates would result in about a a 6.08% increase in value, as more fully explained in the previous two links. Rationale: The discount had narrowed almost 2% from my purchase which gave me a profit after harvesting 4 monthly dividend payments. I am also anticipating a rise in interest rates that will hopefully give me a more advantageous entry point than my last purchase. This security is thinly traded and typically has a large bid/ask spread. Limit orders have to be used. Since I was just buying a 50 share lot, I simply hit the ask price with a limit order rather than fooling with multiple attempts to secure a lower price with an odd lot limit order that can have some unfortunate results when the security is so thinly traded (e.g. a fill of 1 share which has happened to me when I tried a limit order at the bid price). Fidelity does not allow its customers to purchase this type of security. Fidelity Brokerage Extends Denial of Trading Opportunities to Synthetic Floaters I am not aware of another brokerage firm that prevents customers from buying synthetic floaters. That is only one of several categories of exchange traded bonds that are off limits to Fidelity customers. GJT is one unusual exchange traded bond and is probably an inappropriate for most individual investors. The name itself reeks of complexity. Security Description: Synthetic Fixed-Income Securities Inc. STRATS Trust for Allstate Corp. Securities, Series 2006 (GJT) is a Synthetic Floater in the Trust Certificate form of legal ownership. This security makes monthly interest payments at a .8% float over the 3 month treasury bill on a $25 par value, up to a maximum rate of 8%. The maximum yield would consequently be hit with a three month treasury bill rate of 7.2%. At a $17.97 total cost per trust certificate, the maximum yield would be 11.13% (.08% x. $25 par value=$2 ÷$17.97=11.13%). 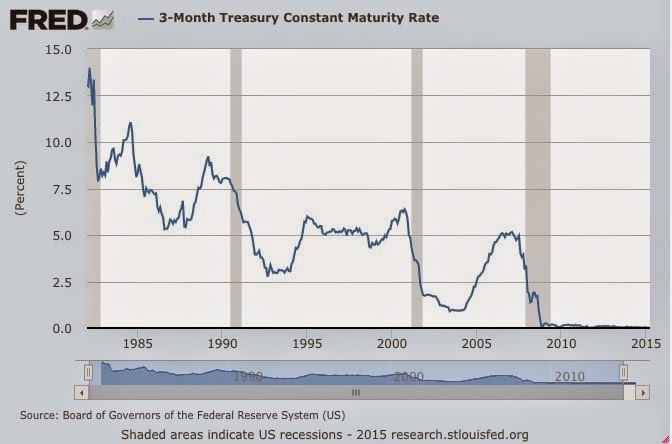 At a zero 3 month T Bill, the yield would be about 1.11%, which is close to where it is now. Until maturity, the actual yield will move up and down between 1.11% to 11.13%, but the yield is not going to increase until the FED starts to raise the FF rate. So, for the past six years or so, this security has in effect paid a .8% float over a barely detectable slither above zero. The underlying security owned by the trust is a 5.95% senior unsecured Allstate bond maturing on 4/1/36. According to FINRA, that bond is currently rated A3 by Moody's and A- by S & P. On 3/25/15, that bond closed at a 33.57% premium to its par value. If Allstate pays the principal amount on 4/1/36, the trustee would then redeem the trust certificates at their $25 par values with the proceeds. In that eventuality, there would be a built in profit for an owner buying at $17.97 and holding the security until that date. 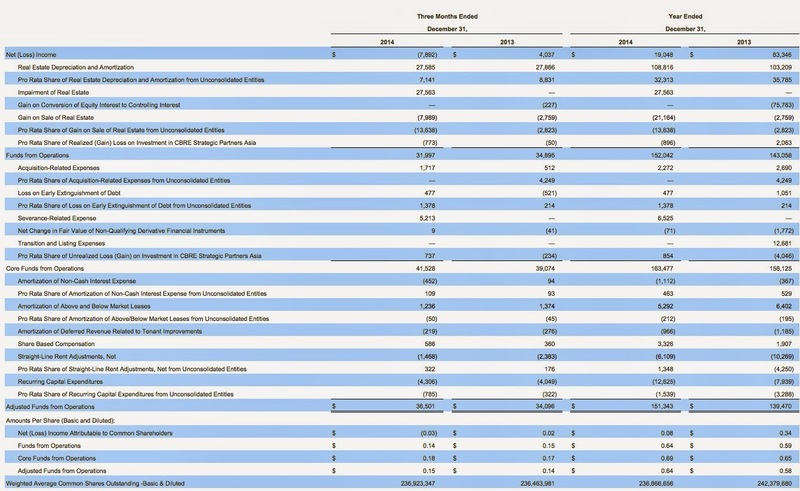 If I assumed that GJT never paid 1% from now until the underlying bond's maturity date, and further assumed a total cost per trust certificate of $17.95, the harvesting of the discount at maturity would at least raise the YTM to 2.81% using the Morningstar Bond Yield to Maturity Calculator The underlying bond at the 133.57 price only has a 3.81% YTM. The owners of GJT do not currently, and have not in the past, received the 5.95% fixed coupon payment. Instead, the trust owns those Allstate bonds and receives those interest payments and then swaps that payment with the brokerage firm that created the trust and who also acts as the "swap counterparty". The brokerage firm then pays the trustee the amount due to the owners of GJT. I recently explained how this works in Item # 1 Bought Back 50 of the Synthetic Floater GYC at $21.67. I would also refer to that posts, and the citations contained therein, for a more complete discussion of the risks relating to synthetic floaters. The reason that the underlying bond is trading at such a premium now is due to a "make whole" provision that would make it punitive for Allstate to redeem this bond. Without going into detail explaining a make whole provision, it basically requires the issuer to pay the bond owners the sum of the present values of all remaining interest payments and the principal payment (par value) discounted to the redemption date using a treasury rate for a similar maturity plus 20 basis points. The sum of the remaining interest payments and the principal amount is a very large number and the current discount rate is very low. Thus, no one expects Allstate to redeem this bond early, and that is why a 5.95% coupon bond is now selling at such a large premium to its par value. There are circumstances where the owners of the synthetic floater will receive the fixed coupon of the bond owned by the trust rather than the float amount. The only example so far occurred for JBK whose swap counterparty was Lehman Brothers. After Lehman filed for bankruptcy, the JBK independent trustee took the position that the BK filing terminated the swap agreement and consequently gave the JBK owners the right to receive the higher coupon paid by the underlying security owned by the trust. It took awhile for investors to figure that out, which allowed me at the time to take advantage of the JBK's significant mispricing. I quickly sold the shares bought in a taxable account after realizing that I had acquired a difficult to understand tax issue. I have not missed anything significant by selling the 50 shares owned in the Roth at $18.9 back in June 2013 and then buying those shares back at $17.97 in March 2015. Rationale: I have not bothered with this security since the 50 share lot purchase in 2011 due to its paltry yield. Most of my purchases were made after this security had been shellacked in price. How do you manage interest rate risk now? GJT has some use in a Roth IRA when short term rates are rising. I suspect, but do not know, that the FED is underestimating inflation pressures building in the economy and may end up having no choice other than to raise the federal funds rate at a faster pace and to a higher level than the market currently anticipates. In that scenario, the three month T Bill rate will be rising with the federal funds rate which will cause this floater to increase its coupon. Fixed rate and longer term bonds could be going down in value with intermediate and long term rates rising due to a significant change in inflation and inflation expectations. Hopefully, this type of security will be going up in value in that scenario and would thus act as a balance for fixed coupon bonds and bond funds owned in the Roth IRAs. If this security is going to work long term, the three month T Bill will need to have an average annual yield much closer to its historical number than the near zero yield over the past 6+ years. There is capital appreciation potential given the discount to par value. Back in early August 2007, there were a few trade above $21.5. The 3 month T Bill rate was close to 4.9% at that time and started to fall in the following months. The perception about the direction of short term rates may be important to the pricing of this security in addition to the current rate. At some point, probably years before maturity would be my best guess now, there will be a spike in short term rates and this security may rise close to par value thus giving its owner the opportunity to harvest the discount before the 4/1/36 maturity. With a 50 share lot, I minimize the risks. I also took into consideration that the out of pocket costs was almost covered by my previous realized gains, so I am close to playing with the house's money. I view the main disadvantage to be the paltry coupon rate. This security is likely to be paying a paltry interest payment for awhile, needless to say. The three month T bill is now near zero. In part, this security is viewed as a hedge against unanticipated and problematic inflation that would likely pulverize long term bonds owned in the Roth IRA which are not sold for whatever reason, including but not limited to stupidity, when and if that scenario arises. The risks are discussed in the prospectus starting at page S-11. I published an Instablog giving a detailed discussion of why I added 100 ELB in my retirement account, pairing it with the purchase of a synthetic floater that I will discuss here later. Markit's U.S. manufacturing flash PMI hit a five month high in March, rising to 55.3. 1. Sold 80 SANPRB at $21.81 (see Disclaimer): I reached the point where the profit was more important to me than the meager income. This security formerly traded under the symbol STDPRB. Rationale: I am satisfied with the 72+% total return in less than 4 years. It does not appear likely that the minimum coupon will be increased for at least two more years. Future Buys: I am no longer interested in this security at a price above $20. Security Description: Agellan Commercial Real Estate Investment Trust (ACR.UN:TOR) owns office and industrial properties in the U.S. and Canada. 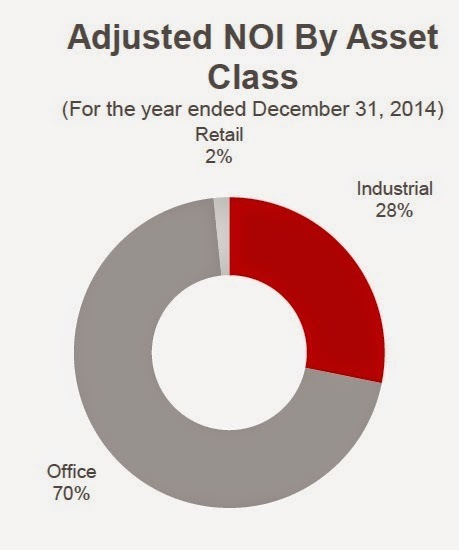 As of 12/31/2014, this REIT owned 41 buildings in the U.S. containing 3.415M square feet of leasable space. The Canadian operation was smaller with 9 buildings containing 934,000 square feet of leasable space. As noted below, the Board has authorized management to explore selling all or substantially all of Agellan's Canadian properties in order to focus on the U.S. One Canadian property, 20 Valleywood Drive, was sold for $8.5M before closing costs. I believe that sum would be in CADs. Brad Thomas published a Seeking Alpha article discussing this REIT last October. The market cap at my purchase price was slightly over C$216M. In February 2015, Agellan announced that it had acquired 6 industrial properties in Atlanta for US$12.9M before closing costs. Agellan is acquiring those properties from the U.S. REIT First Industrial. The properties are known as the Oakbrook Technology Center and are currently 95% occupied with 28 tenants, but the occupancy level is expected to decrease to 91% on 3/1/15. The "purchase price represents a going-in capitalization rate of approximately 8.4%". Agellan funded the purchase with cash on hand and the net proceeds realized from selling a Canadian property (20 Valleywood Drive, Ontario) at a 5.9% in place capitalization rate. At a total cost of C$9.13 per unit, the dividend yield at that monthly rate would be about 8.49%. The next distribution will be payable on 4/15/15 to shareholders of record on 3/31/15. Distribution Withholding Tax: Canada will withhold a 15% tax on distributions paid by REIT irrespective of whether the REIT is held in an IRA or a taxable account. I consequently own all of my Canadian REITs in a taxable account since there is no way to recover a foreign tax when the distribution is paid into a retirement account. A ran a test to confirm that Canada will withhold a tax on REIT distributions made into a retirement account, buying 100 shares of three different Canadian REIT in three different retirement accounts. In every case, the tax was withheld. I took a snapshot of the withholding for 100 Artis 100 units in a blog: Scroll to Artis REIT I waited until I could sell that 100 unit lot for a profit and then jettisoned the position. This Schwab summarizes the particulars about claiming a tax credit for foreign taxes. The market price has slid from C$9.85 close on 2/23/15 to C$9.1 on 3/17/15. A small part of that decline can be attributed to an ex-distribution on 2/25/15. The 4th quarter results were released after the market's close on Friday 3/6/15. The shares closed at C$9.39 that day and at C$9.1 on the next Monday, or about a 2.5% decline. Most likely, the decline was attributable to the earnings report discussed below. Recent Earnings Report: All amounts are in CADs. For the 2014 4th quarter, Agellan reported diluted AFFO per unit of $.207 per unit, up slightly from $.203 in the 2013 4th quarter. 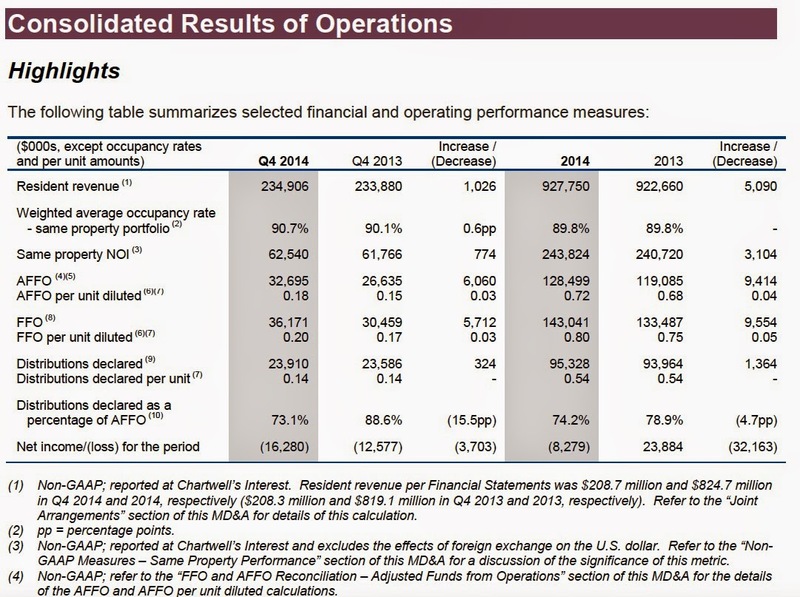 For 2014, AFFO per unit increased to $.855 per unit from $.795 per unit, or a decent increase of about 7.4%. Agellan paid distributions of $.775 per unit during 2014. The annual FFO was reported at $1.146 per unit vs. $1.106 in 2013. When there is a material difference between FFO and AFFO, I will use AFFO in a valuation and dividend analysis. At a total cost per unit of C$9.13, the TTM P/FFO would be 7.97, and the TTM P/AFFO would be 10.68. Agellan is reasonably priced using either FFO or AFFO as the valuation metric. It is certainly cheaper than U.S. REITs who have an aggregate P/FFO of 19.4 as of 2/28/15, see page 3 of Lazard's monthly real estate report. Rationale: The price is reasonable based on a TTM P/AFFO or P/FFO. The dividend yield is good, particularly in a world without risk free yield. I am funding this purchase from a CAD stash that is otherwise earning nothing. If the ordinary shares priced in CAD go up, and the CAD's value sinks against the USD, I will increase my CAD stash by selling at a CAD profit while reducing my reportable profits for tax purposes. For tax purposes, profit and losses are calculated by converting the cost and proceeds from CADs into USDs, so there is less of a taxable gain for a U.S. taxpayer when the CAD falls in value against the USD after the purchase until the security is sold, using CADs to pay for the purchase and receiving CADs as proceeds. It would also be possible to have a CAD profit and a reportable tax loss, or a CAD loss and a reportable tax profit. The I.R.S. does not want U.S. taxpayers reporting gains and losses in foreign currencies, but only in USDs. Risks/Issues: I am a long term holder of Canadian Dollars, primarily for diversification purposes. I do not want all of my assets denominated in USDs. Consequently, I am not concerned about the up and down fluctuations of the CAD/USD exchange rate. Given the weakness of the CAD over the past two years or so, it is cheaper now for a U.S. investor to convert their USDs into CADs to buy securities on the Toronto exchange. The owner of a USD priced Canadian security has experienced a substantial headwind compared to the ordinary shares priced in CADs and traded in Toronto. This can be seen by drawing a one year chart comparing the USD priced Canadian stock with its the ordinary shares priced in CADs. The only difference in SU and SU.TO is the currency in which the stock is traded. If the CAD starts to rise against the USD, then the USD priced SU shares would outperform the ordinary shares traded in Canada and priced in CADs. A continued decline in the CAD would result in the USD priced ordinary shares to underperform the CAD priced ordinary shares. It does not matter whether the U.S. investor buys SU on the NYSE using USDs or converts those USDs into CADs to buy in Toronto and then convert the CADs back to USDs after selling SU.TO. The only difference would be any fees charged by the broker for the currency exchange and any difference in broker commissions connected to international trading. Fidelity would charge me C$19 for a Toronto exchange trade and $7.95 for a U.S. exchange trade. If I did not already own CADs, I would have to pay a 1% conversion fee to buy CADs with my USDs in order to complete a trade in Toronto. The Agellan ordinary shares trade on the U.S. Grey Market, a dark market, where bid and ask prices are not displayed and liquidity is unfavorable. Limit orders are a necessity. ACRVF Agellan Commercial Real Estate Investment Trust If I was inclined to trade in that market, and I try to avoid it, I would first convert the ordinary share price into USDs and then set a limit price. The daily average volume for ACRVF is 213 units, but 3,300 traded on 3/20/15. The prices were in a narrow band between $7.2398 to $7.2645, with a closing price of $7.2645. The ordinary shares closed at C$9.19 which converted into about US$7.2357. The Grey Market price was a little high, but close to the ordinary shares priced in CADs. The price may be even closer by taking the CAD/USD exchange rate at the time of closing. If one CAD could buy 1 USD last Friday, then ACRVF would have been priced closer to $9.19, the closing price in Canada, than at $7.26. Since this Canadian REIT is weighted in U.S. properties, there is also a currency risk for it. Future Buys/Sells: I am not likely to buy more. I do not have a target price. I would be content to harvest a 10% annualized total return based on CADs. Most of that total return can originate from the dividend. I have published an Instablog that has excerpted the following discussion of the DPG purchase (Item # 4). The difference is that there is a long introduction prior to that excerpt in the Instablog. CoreLogic estimates that 1.2M borrowers moved into positive home equity in 2014. The Federal Housing Finance Agency (FHFA) estimated in February that 652,000 homeowners were eligible to refinance through the HARP program and had a "strong financial reason to refinance". Starting in 2009 through the 2014 4th quarter, Fannie and Freddie have refinanced 20,409,043 mortgages. 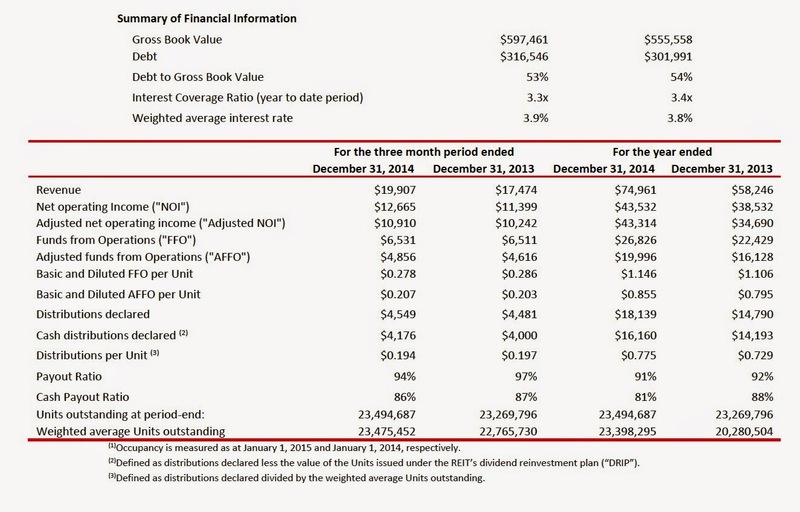 4Q14-Refi-Report.pdf That total does not include privately owned mortgages. 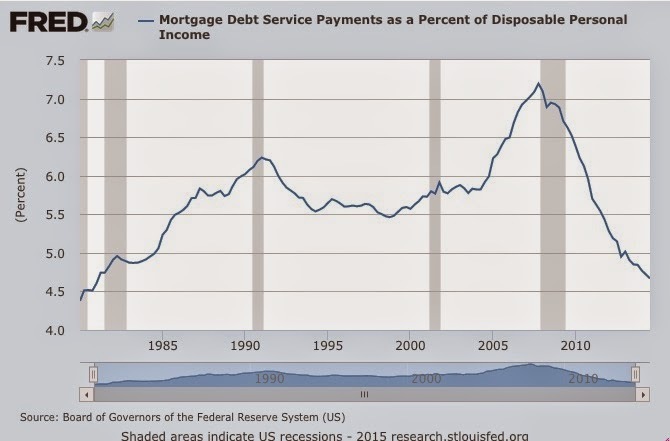 Mortgage debt is by far the largest component of household liabilities. Security Description: The Corporate Asset Backed Corp. CABCO Series 2004-102 Trust SBC Communication Inc. Floating Rate Certificates (GYC) is an Exchange Traded Bond. GYC is a Synthetic Floater in the Trust Certificate form of legal ownership. For this security, UBS created a grantor trust, administered by an independent trustee, and sold to that trust senior unsecured SBC Communication bonds (now AT & T). Those bonds are commonly referred to as the underlying security. The AT & T bonds mature on 6/15/2034 and have a 6.45% coupon. The grantor trust raised the funds to pay UBS through the public sale of trust certificates, each with a $25 par value. The owners of the trust certificates are the beneficial owners of those bonds. UBS also entered into a swap agreement with the trustee. As a result of that agreement, the trustee delivers to the swap counterparty, originally identified in the GYC prospectus as UBS, the interest paid by AT & T, and the swap counterparty delivers to the trustee the amount owed to the GYC owners. Assuming no early termination of the swap agreement and/or the trust, GYC matures at the same time as the underlying bond which is 6/15/34. Rational: This type of security does contain some deflation/low inflation and problematic inflation protection in the same security. It consequently provides some interest risk protection that the underlying fixed coupon AT & T bond does not provide. I suspect that the FED is underestimating inflation pressures building in the economy now. The strong USD and the dramatic decline in energy prices have masked a buildup of inflationary pressures elsewhere. Businesses are finding it increasingly difficult to find employees to fill job openings. The NFIB's last survey showed that 29% of small businesses could not fill job openings, with the unfilled job openings near 40 year highs. Over the past several weeks, there are been a number of news stories about retailers voluntarily hiking their wage levels. On the day of Yellen's news conference, where she stated that "we may not see wage growth pick up" and there was no "broad" based wage pressure, the WSJ ran a story that Target was going to raise the pay for all workers to at least $9 per hour next month and to $10 next year, "as competition heats up for lower wage workers, and following on the foot steps of pay raises announced by Wal-Mart and many other companies. The WSJ story was originally published last Wednesday. Depending on the future 3 month Libor rate, the yield will fluctuate between the minimum 3.75% to the maximum of 9.23% based on a total cost per share of $21.67. An increase in the coupon will occur when the 3 month Libor rate exceeds 2.6% during the relevant computation period. Assuming no redemption prior to maturity, there would be a $3.33 profit per TC on 6/15/34. It is certainly possible that most or all of the current discount could be harvested before maturity. Risks: This security has a low minimum coupon that is not likely to increase, as intermediate and long term rates rise due to interest rate normalization. The recent decline in the share price is probably due to that rise in rates. GYC hit $25 in May 2013 before hitting the skids, again, and falling to near $19 per share. Over the past year, GYC has traded mostly in the $21 to $23 price range. The price plummeted to $11 during the Near Depression. GYC Interactive Stock Chart A long term chart will frequently highlight the risks. At some future time, the 3 month Libor rate may rise sufficiently to trigger an increase in the coupon. The increase will occur when the 3 month LIBOR rate rises above 2.85% during the relevant computation period. A rise in the coupon above the minimum 3.25% level will not happen for as long as the FED continues ZIRP and for an uncertain period thereafter. A lot depends on future inflation numbers that will impact both the size and the pace of Fed tightening. The 3 month Libor rate will be linked to the federal funds rate. In the prior tightening cycle, the federal reserve raised the federal funds rate from 1% to 5.25% between June 2004 to July 2006. The 3 month Libor rate followed in tandem the increases in the federal funds rate. Currently, I do not anticipate that the FED will start a tightening cycle by raising the federal funds rate prior to 2015. Unless there is a significant pick up in inflation and inflation expectations, I would further anticipate a much slower rise in the federal funds rate compared to the prior tightening cycle. (2) The second risk involves what I will generally call the GJN problem. There is a NYT article describing what Wells Fargo did to the mops and pops who owned GJN. NYTimes.com; Stocks, Bonds & Politics: GJN-Wells Fargo-New York Times I brought this matter to the attention of Floyd Norris at the NYT. I am not going to copy or repeat that lengthy and frequently complicated discussion. Instead I will just briefly summarize this complicated issue and emphasize the importance of both reading and understanding the prospectus prior to making an investment. There is an important difference between GYC and GJN. AT & T can not redeem the underlying senior bond and avoid a make whole payment. In the now infamous GJN situation, J P Morgan relied on an escape hatch that purportedly allowed it to avoid a make whole payment. I am surprised that no one has challenged JPM on whether or not it invoked that escape clause in a timely manner. Stocks, Bonds & Politics: District Court Decision in Turkle Trust v. Wells Fargo (N.D. Cal)/Summary of Argument: JPM Potential Obligation to Pay Make Whole for its Recent 2035 TP Redemption/Other JPM Capital Trust Preferred Securities: Language on Make Whole Payment and Capital Treatment Event (July 2012). A make whole payment made by AT & T could be used to pay the swap termination fee triggered by an early redemption of the AT & T senior bond. Another possibility is that the owner of the call warrant will redeem the certificates at par value plus accrued interest when and if AT & T redeems the bonds. That would occur when the make whole payment would exceed the swap termination fee. The swap termination fee is payable after certain trust termination events that do not involve a redemption of the underlying bonds by AT & T, Prospectus at pp. S-7, S-32-33. Those events include the bankruptcy of AT & T; an AT & T payment default without a bankruptcy; a legal change that makes it unlawful for the trust to perform; and a SEC reporting failure by AT & T. Any of those occurrences listed in the prospectus, while unlikely, would be disastrous for the owners of GYC, since any such event would trigger a swap termination fee without a make whole payment being received from AT & T. At the present time and for the foreseeable future, I am not simply not concerned about AT & T filing for bankruptcy or defaulting on its debt, and I can not reasonably foresee a law change that would cause the trust to default. Those are black swan type of events/risks. While I can not say with certainty that a make whole payment for an early redemption would be sufficient to cover the swap termination fee, both amounts would be calculated by taking the principal amount and all future interest payments and then discounting to present value. The major difference is that there is a specific provision in the AT & T bond prospectus that specifies exactly how that calculation has to be done. The existence of a make whole payment would also make it highly unlikely that AT & T would redeem the underlying bond for the foreseeable future. It was the redemption of the underlying bond that triggered the swap termination fee payment in the GJN situation. While it is just my opinion, nobody in their right mind would redeem a long term bond with a 6.45% coupon when the optional redemption requires a make whole payment. The make whole payment would just be huge, at least until shortly before the maturity of this bond. It would consist of the principal amount of the bond ($1,000) and all interest payments from the time of redemption until the scheduled maturity date on 6/15/34, discounted to present value using the rate of a comparable maturity treasury security plus .2%. A low discount (3%) rate juices the make whole payment, compared to a higher rate. (see underlying security prospectus at page S-11 to S-12). Still, the GJN situation has put a damper on my enthusiasm for these currently low yielding securities. I will tread cautiously with 50 share nibbles here and there. Future Buys: Given the risks and current low yield, I am not likely to buy more. I will likely sell the 50 shares at a price north of $23. This security has a limited purpose in my IRA, which involves an effort to create some balance and interest rate sensitivity to the heavier weighted fixed coupon bonds and bond funds that are owned in those accounts. Prior Trade: This is an average down from a 50 share lot purchase made shortly before the quarterly ex dividend date. 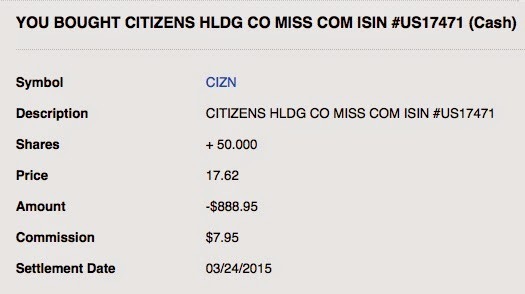 Item # 2 Bought Back 50 CIZN at $18.76-Regional Bank Strategy (3/12/15 Post) I did mention that I would not buy more. However, I thought the price drop to $17.62 was too tempting to pass up and so I added 50 more shares. If and when I can sell the higher cost lot at a profit now, I will consider doing so and then keep the lower priced shares using FIFO accounting. At a total cost per share of $17.62, the current dividend yield is about 5.22%, and the TTM P/E is about 11.52. I have nothing else to add to that recently published post. Company Description: Chartwell Retirement Residences (CSH.UN:TOR) is an unincorporated trust which owns and manages a portfolio of senior housing communities. It is the largest participant in the senior housing segment in Canada. Chartwell owned 33 properties, with 4,792 suites, and leased two others (91% assisted living; 5% "memory care" and 4% skilling nursing) Those properties are encumbered by US$439M, which Chartwell will be netted with the purchase, along with about $24M in repayment penalties, at closing. Chartwell expects to net C$410 after costs and taxes at the then current exchange rates. The transaction is currently expected to close during the third quarter. The proceeds will be used in part to fund Canadian expansion projects. The long term chart highlights risks. The units were selling at one time over C$17 back in 2007 and then cratered to near C$3 during November 2008. Since smashing into that low, the units have been rising in a fairly steady 45º angle with some chop. Distributions: Distributions are paid monthly in Canadian Dollars. Chartwell's distribution history is viewed by me as entirely unsatisfactory and a major drawback to any meaningful investment. Chartwell cut is monthly distribution from C$.0875 to $.06167 effective for the March 2008 payment. 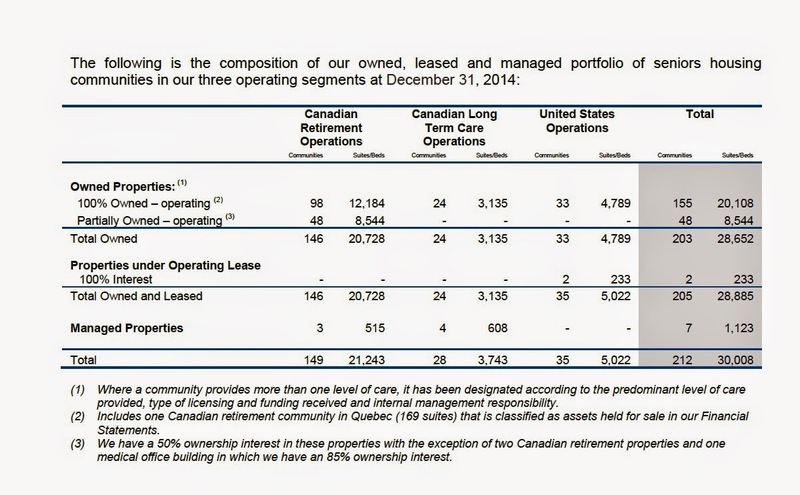 For a Canadian REIT, the 2014 AFFO payout ratio of 78.9% is low. Many of them are over 90%, with some close to a 100%. A chunk of that debt will be removed when the U.S. operations are sold, as noted above. It is possible that mortgage debt maturing in 2015-2017 may be refinanced at lower interest rates. Rationale and Risks: The primary reason for purchasing this security is diversification in my REIT basket. Chartwell is the largest owner of senior housing in Canada. I view the dividend yield as barely satisfactory and the dividend history to be unsatisfactory. It remains to be seen whether Chartwell will be better off after selling its U.S. properties and reinvesting the proceeds into new Canadian properties. There is a lot of debt on the balance sheet, even after adjusting for the liquidation of the U.S. related debt. For a U.S. buyer, there is significant currency risk. That risk is not avoided at all by using USDs to buy a Canadian security. The USD price will reflect the ordinary share price in CADs converted into USDs. The decline in the CAD/USD has been a major negative for USD priced Canadian securities for a year or so. The ordinary shares do trade in the U.S. "Grey Market" where bid and ask prices are not displayed and liquidity is practically non-existent. CWSRF Chartwell Retirement Residences The last trade was a 100 share lot on 5/6/13. Some brokers add a significant fee to trades in that market over and above their regular commission rates. I would not fool with it. The company describes risks starting at page 51 of its last earnings report: Chartwell.Pdf. Security Description: The Duff & Phelps Global Utility Income Fund (DPG) is a leveraged closed end stock fund that invests in electric, gas and water utilities, telecommunication companies and MLPs. Note 8 of that shareholder report contains details about the fund's borrowing costs. For the F/Y ending in October 2014, the average daily borrowings and the weighted average interest rate were $260M and .95%. respectively. The rate was at .89% as of 10/31/14. The largest weighting in the oil and gas infrastructure sector was Kinder Morgan (KMI) at 5.1$ as of 1/31/15. 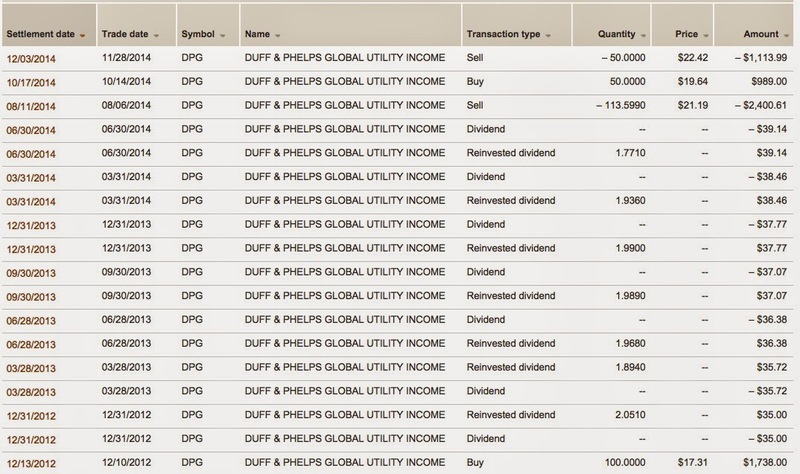 Prior Trades: I sold earlier this year 100 of the 200 DPG shares owned in a taxable account. Item # 1 Sold 100 of 200 DPG at $20.74 (2/17/15 Post)(realized gain snapshot= $200.07). I sold my highest cost shares bought at $18.58 and kept the lower cost lot purchased at $17.3. Rationale: The recent corrections in the MLP, telecommunications and utility sectors have made this leveraged CEF slightly more palatable on a risk/adjusted basis. I only nibbled with a 50 share purchase, however. Without an ex-dividend, the net asset value per share declined 9.11%. The dividend yield is currently about 7.16% based on a total cost per share of $19.54. That income is tax free in the Roth IRA. I have managed, so far at least, in creating decent total return numbers trading this fund. While I view the U.S. electric utility stocks to be overvalued, and have no opinion about the foreign ones, their overall weighting in the portfolio is not large. 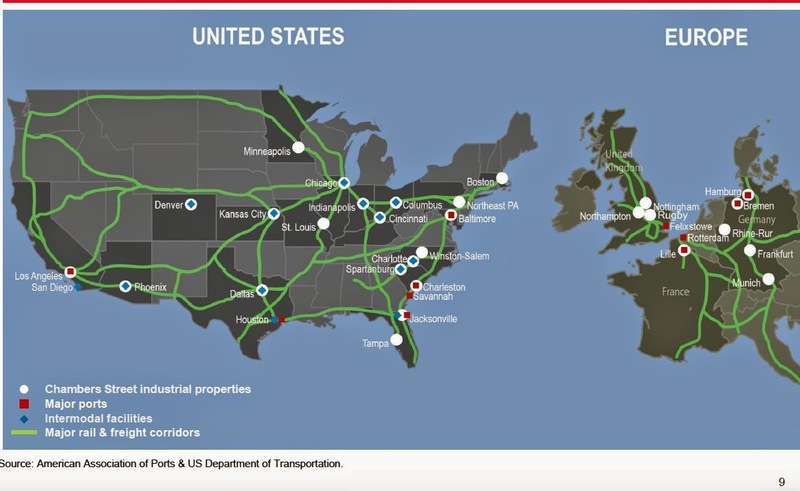 The MLP infrastructure companies have been weak over the past several weeks due in part to fears that energy prices and/or future decreased production will adversely impact them. Risks: The risks are fairly typical for a leveraged closed end sector fund that buys securities worldwide. There will be some currency risks, the normal CEF risks (e.g. expansion of discount after purchase), price risk due to valuations of owned securities, interest rate risks to the prices of bond substitute securities, and the risks associated with leverage (e.g. 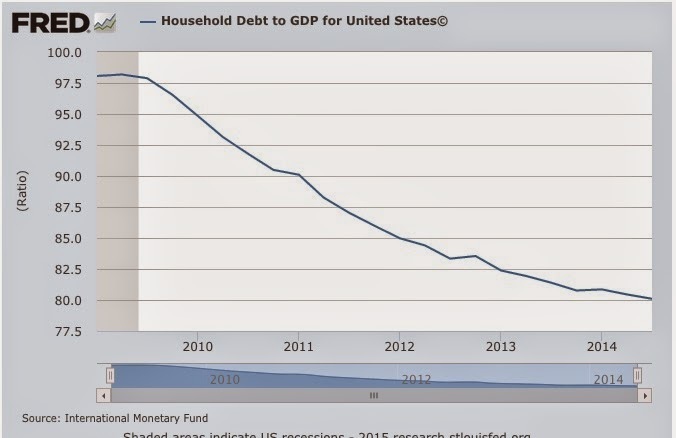 borrowing costs, buying assets which decline in price with borrowed money adding to the woes, etc.) The sponsor discusses risks at its website and in the Prospectus starting at page 46. As of 3/19/15, the Utilities Select Sector SPDR ETF (XLU) had a forward estimated P/E of 16.68 and a dividend yield of only 3.35%. The estimated 3 to 5 year E.P.S. growth rate was 5.64%. The P.E.G. ratio is elevated due to the low growth rate and high P/E. This sector is vulnerable to a correction precipitated by even a modest rise in rates that diminishes the allure of a 3.32% yield and further calls into question such a high P/E for a sector growing earnings only in the low single digits. A P.E.G. of 2 to 2.5 would be closer to a fair value range with rates rising, an estimated 3 to 5 year E.P.S. growth rate of 4% to 5%, provided the rise in rates ebbs below the average historical norms. 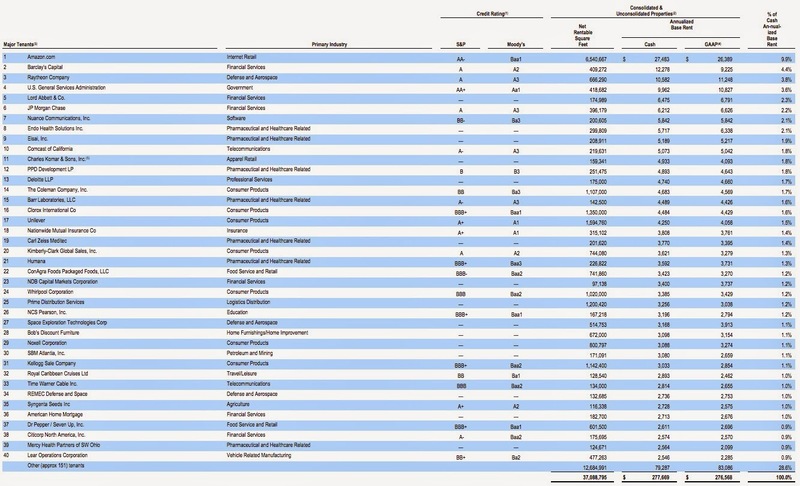 As of 2/28/15, this Vanguard fund owned 78 stocks, with a P/E of 18.4.8 times and a 2.5% earnings growth rate. Portfolio & Management That P/E and growth rate simply does not compute for my Left Brain who views it to be at best irrational, a description used whenever it decides to be pleasant about something viewed as nutty.